Slap Cup is a fast-paced drinking game that is competitive in nature. During the game, each person participates individually as they attempt to bounce a ping pong ball into their cup as quickly as possible. To set up Slap Cup, find a flat surface like a table that has enough room around it for the participants to stand. A round table is best. Fill about 20 Solo cups 1/3 of the way up with beer or another alcohol of your choice. Next, place the cups together in the center of the table, creating a filled in circle. Leave two Solo cups empty and place one in front of each opponent opposite one another. Each player should also have one ping pong ball. The game begins with just two opponents. 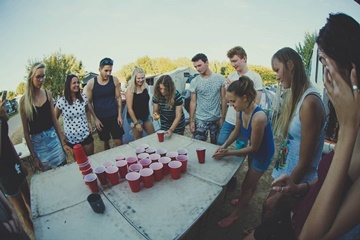 As Slap Cup is fast-paced and can be unpredictable at times, all players must stay alert. The rules are fairly simple. Two people stand on opposite sides of the table with an empty cup in front of them and a ping pong ball in their hand. The first player will throw and bounce the ball to try and make it into his or her opponent’s cup. The second player will then do the same. If either player makes the shot, they pass the cup and the ping pong ball to the person next to them. If the person makes the shot on their first try, they have the option to pass the ball and cup to anyone at the table. If a player makes a shot and the person that is directly to their left is still trying to make theirs, they have the option to “slap” their cup away from them. That person then has to grab a new cup from the center of the table, swig it, and try to make the shot into the new cup. When all the cups are gone, the game is over. The last person to have their cup slapped has to swig a full cup of beer.